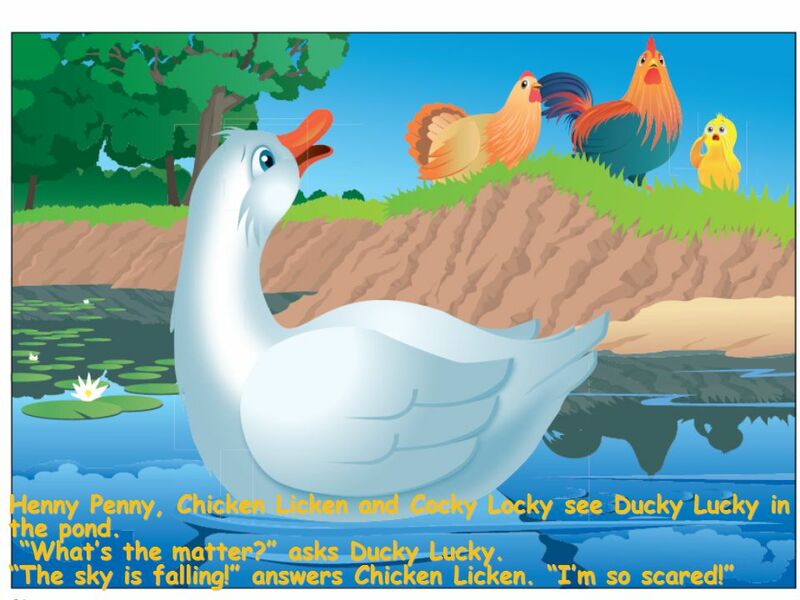 This is a story about Chicken Licken. 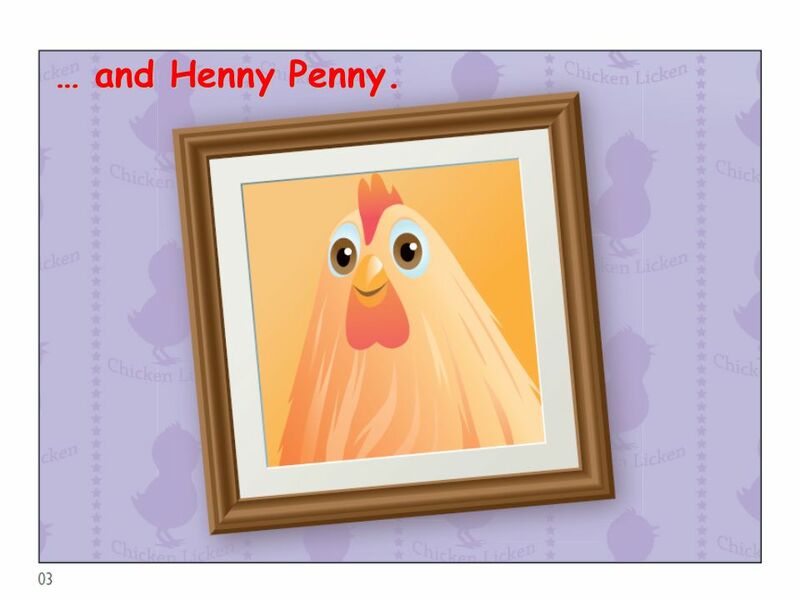 … and Henny Penny. 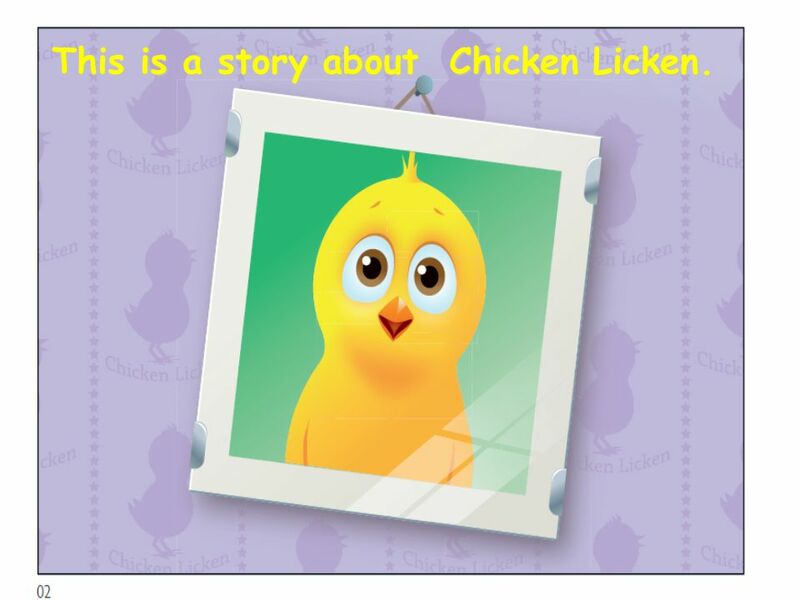 2 This is a story about Chicken Licken. 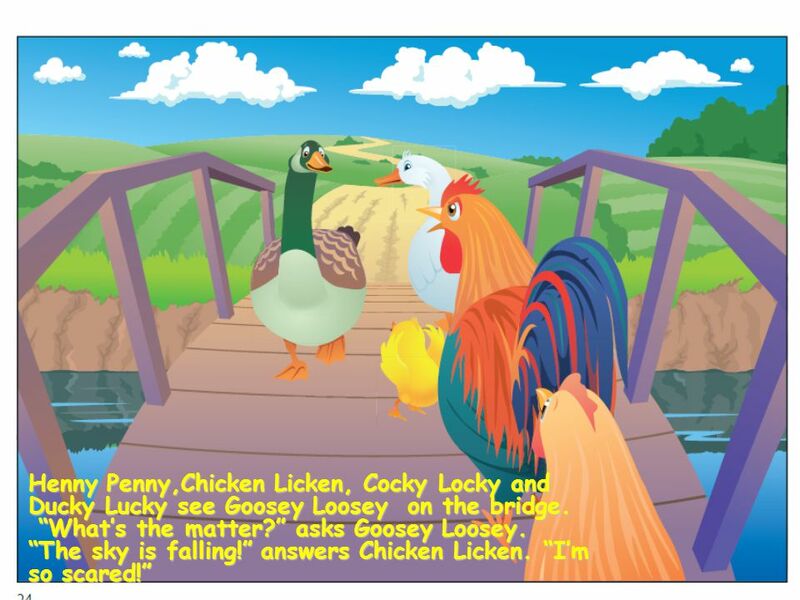 3 … and Henny Penny. 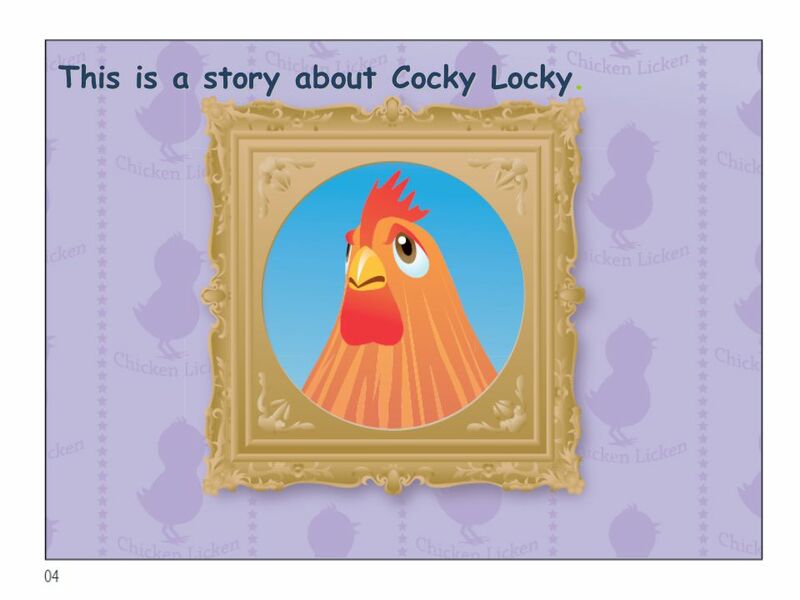 4 This is a story about Cocky Locky. 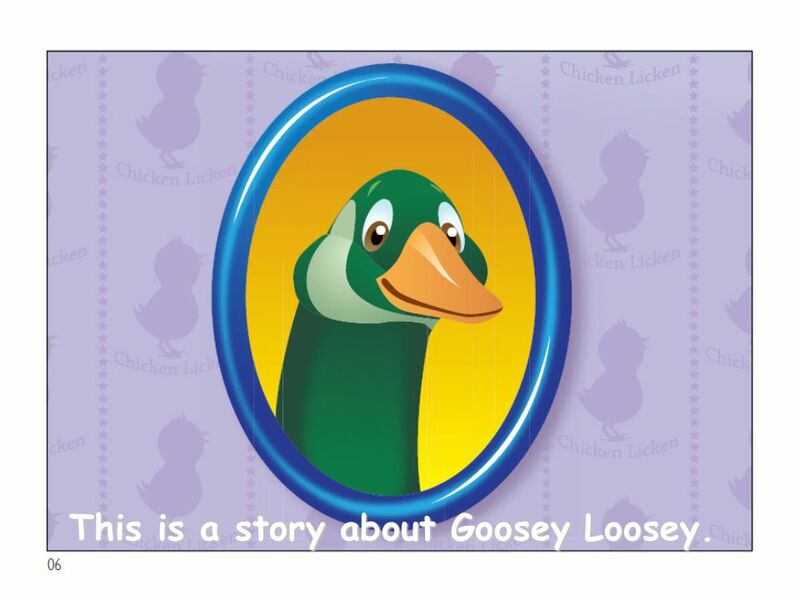 6 This is a story about Goosey Loosey. 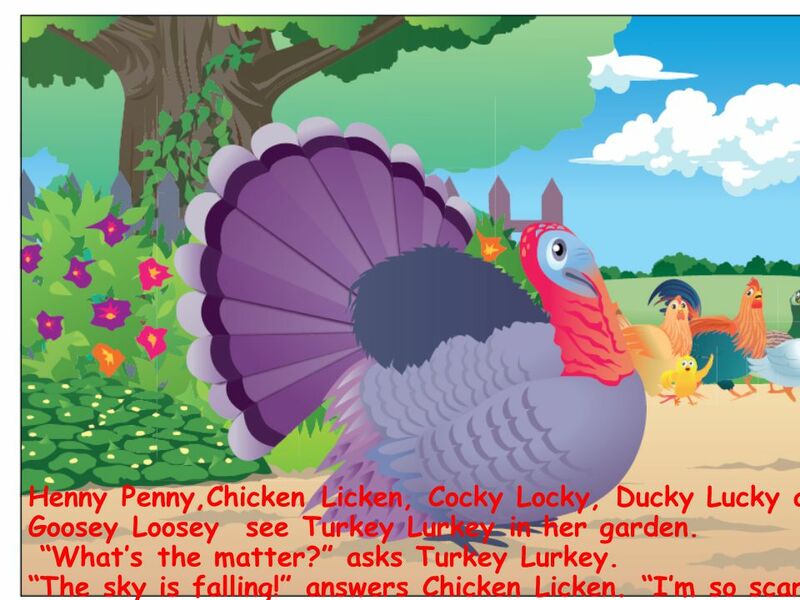 7 ….. and Turkey Lurkey. 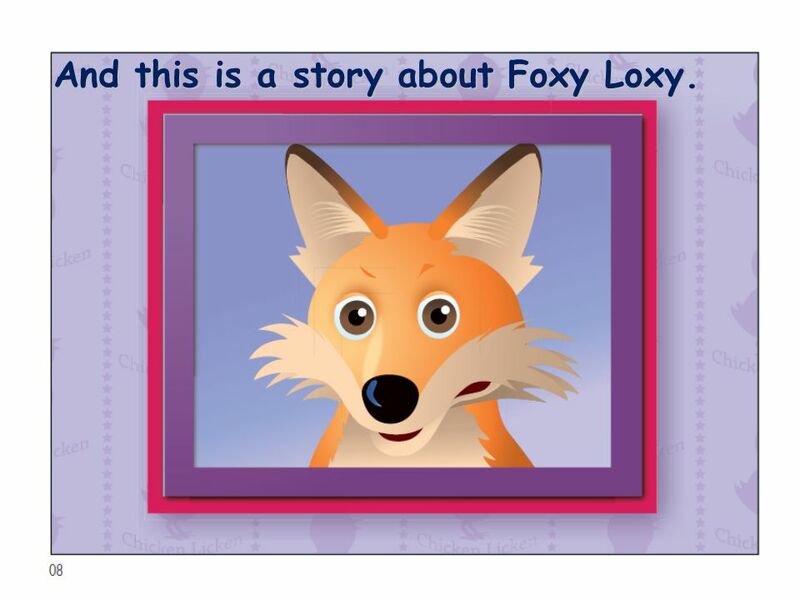 8 And this is a story about Foxy Loxy. 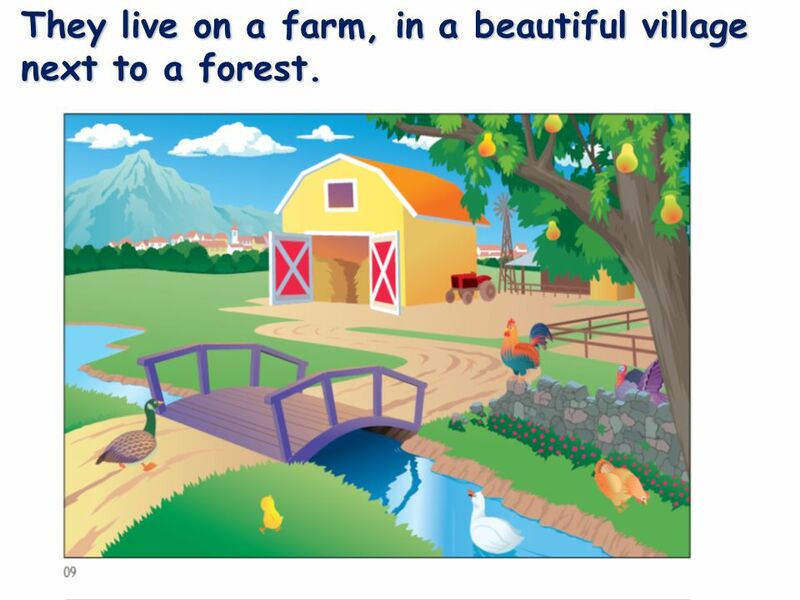 9 They live on a farm, in a beautiful village next to a forest. 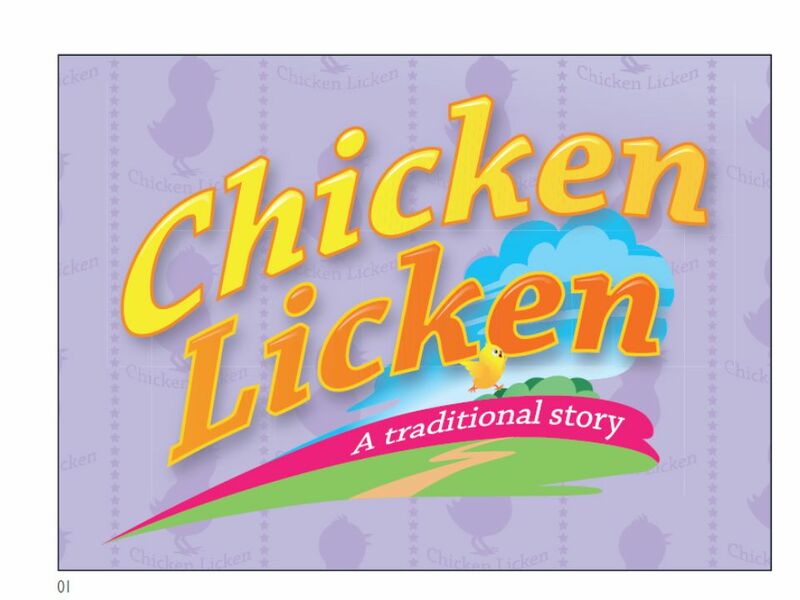 11 One day Chicken Licken is sleeping under a tree. 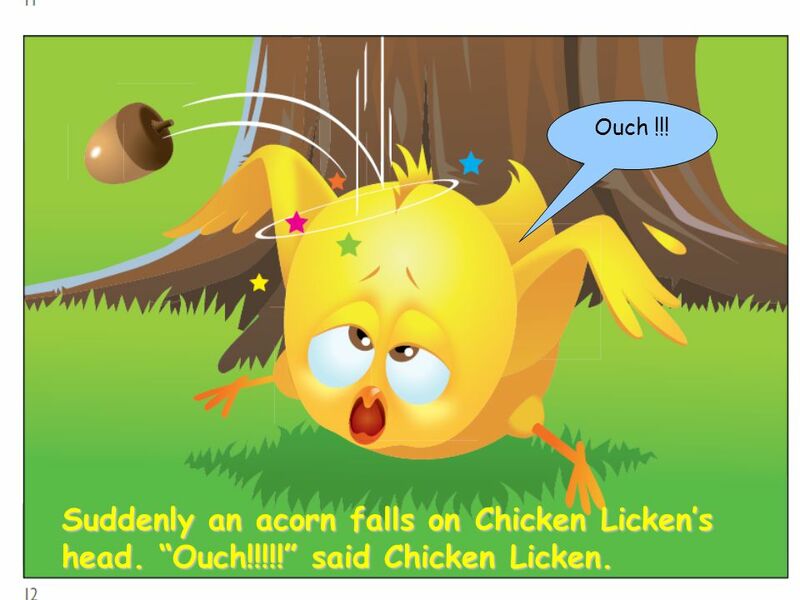 12 Suddenly an acorn falls on Chicken Licken’s head. “Ouch!!!! 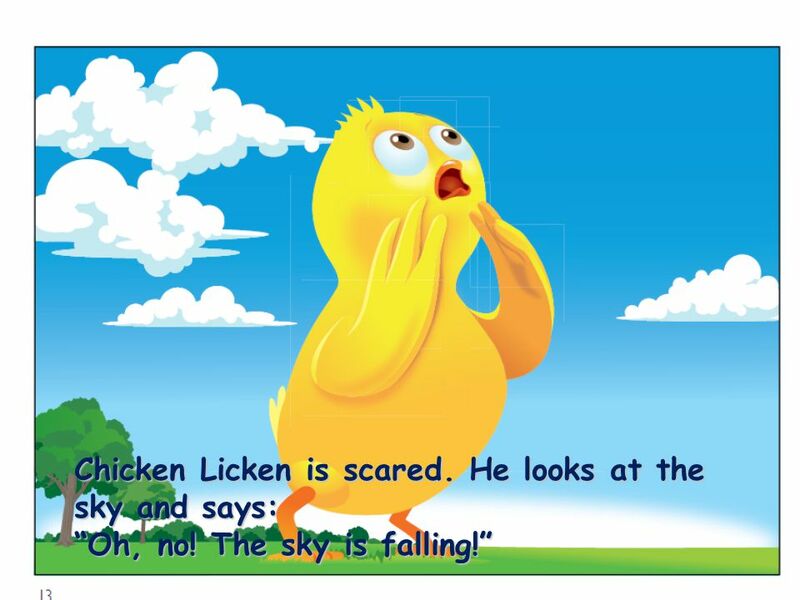 !” said Chicken Licken. Ouch !!! 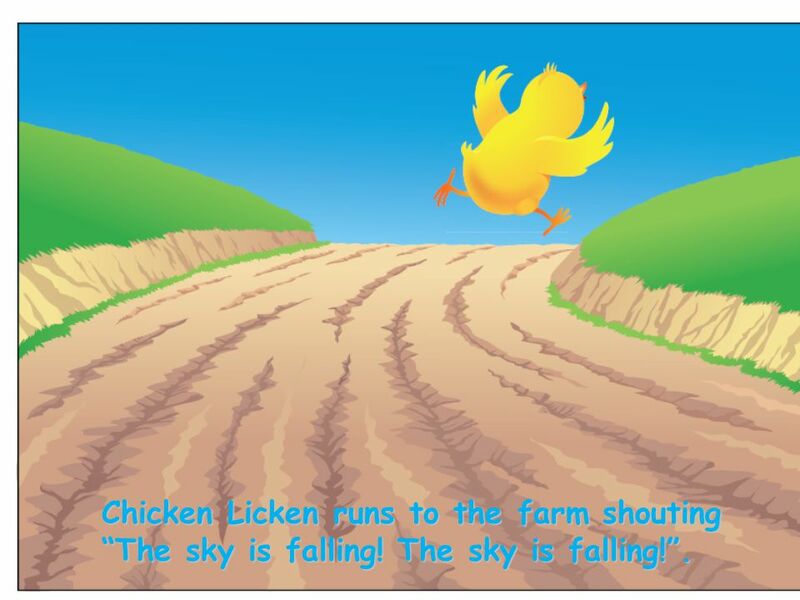 14 Chicken Licken runs to the farm shouting “The sky is falling! 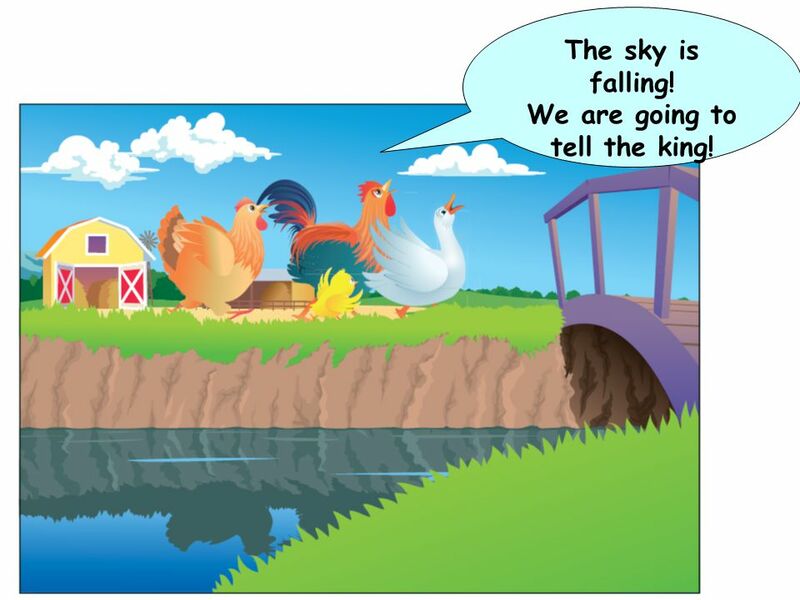 The sky is falling!”. 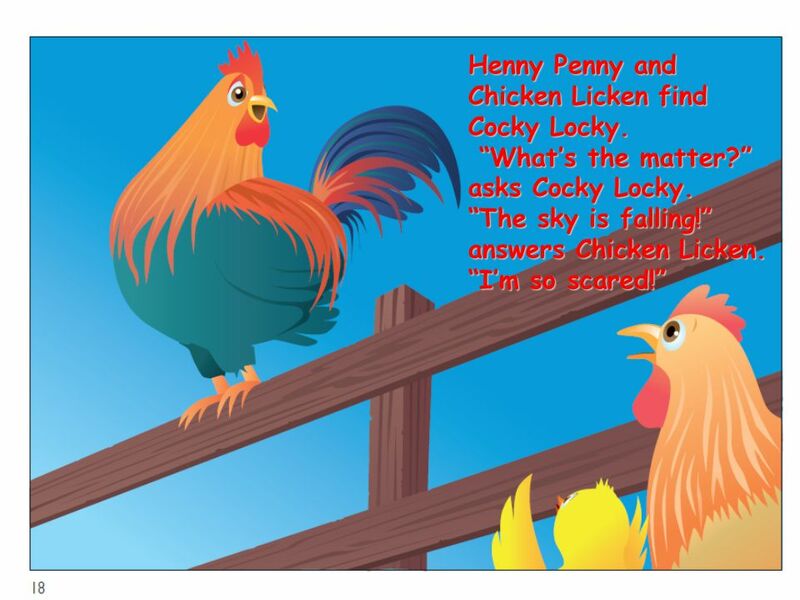 16 “Oh, no!” says Henny Penny. 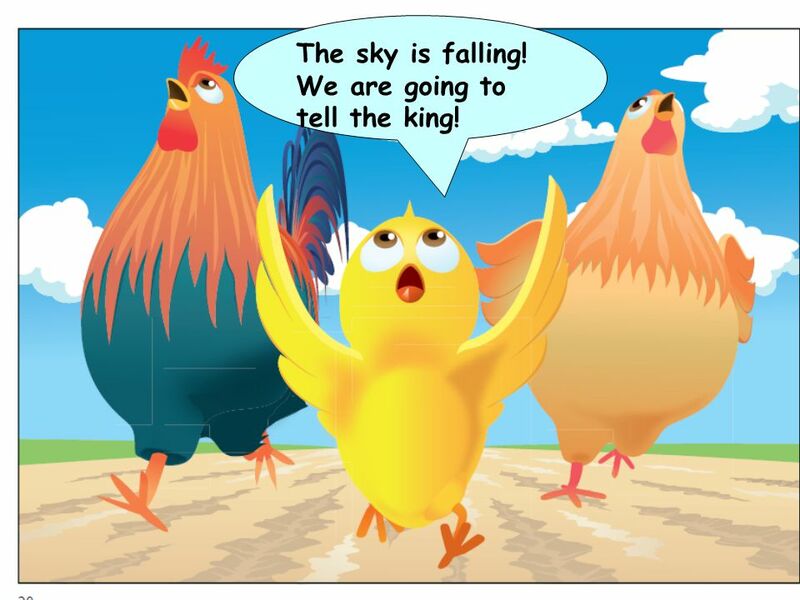 “What shall we do?” “Let’s tell the king!” says Chicken Licken. “Yes, let’s tell the king! 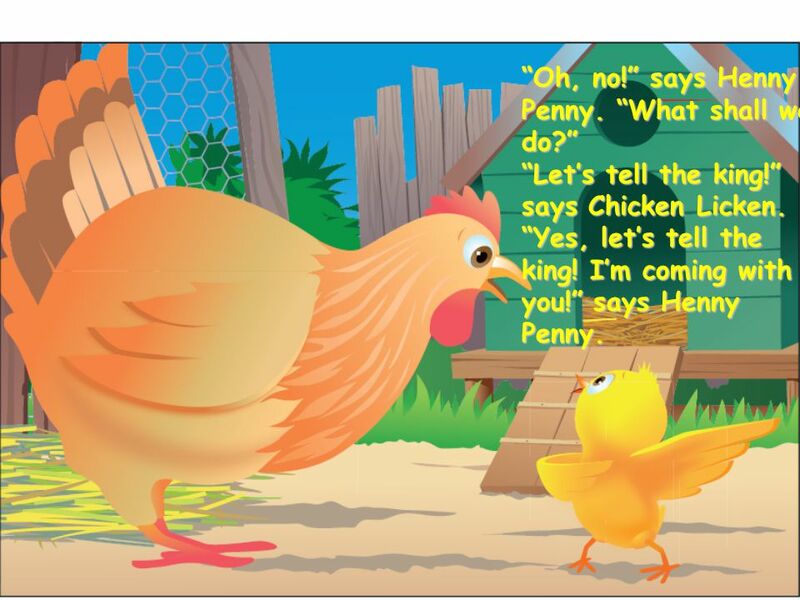 I’m coming with you!” says Henny Penny. 17 The sky is falling! We are going to tell the king! 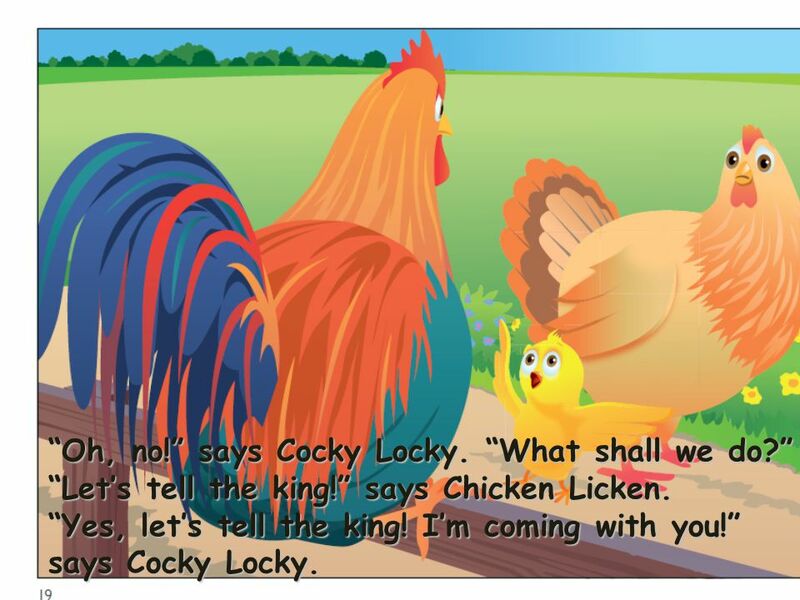 19 “Oh, no!” says Cocky Locky. 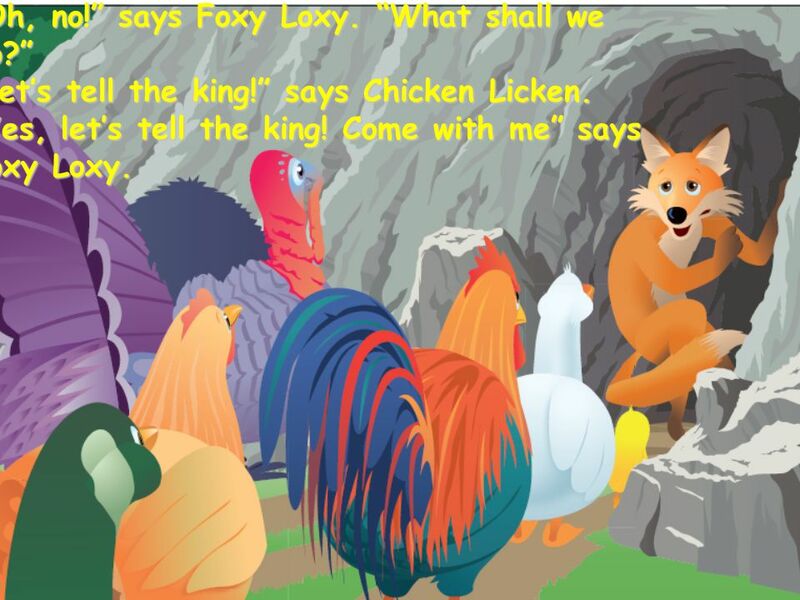 “What shall we do?” “Let’s tell the king!” says Chicken Licken. “Yes, let’s tell the king! I’m coming with you!” says Cocky Locky. 20 The sky is falling! We are going to tell the king! 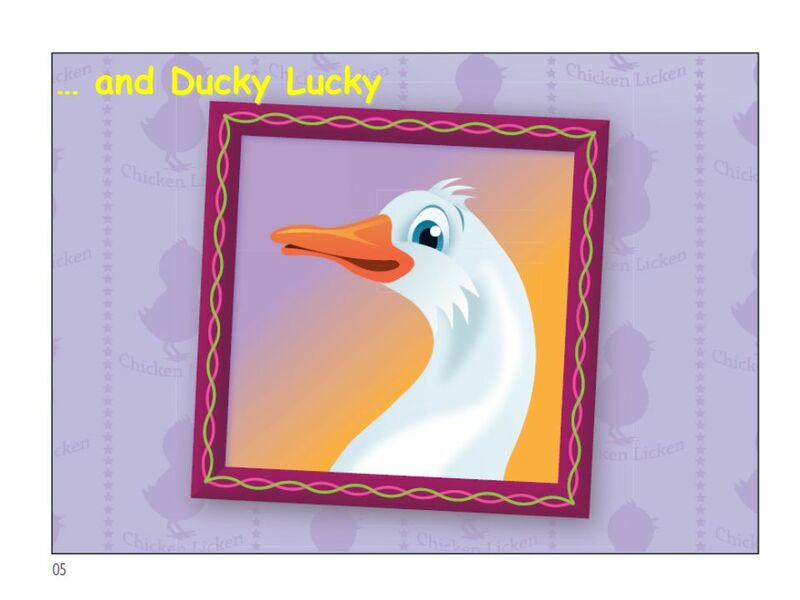 22 “Oh, no!” says Ducky Lucky. 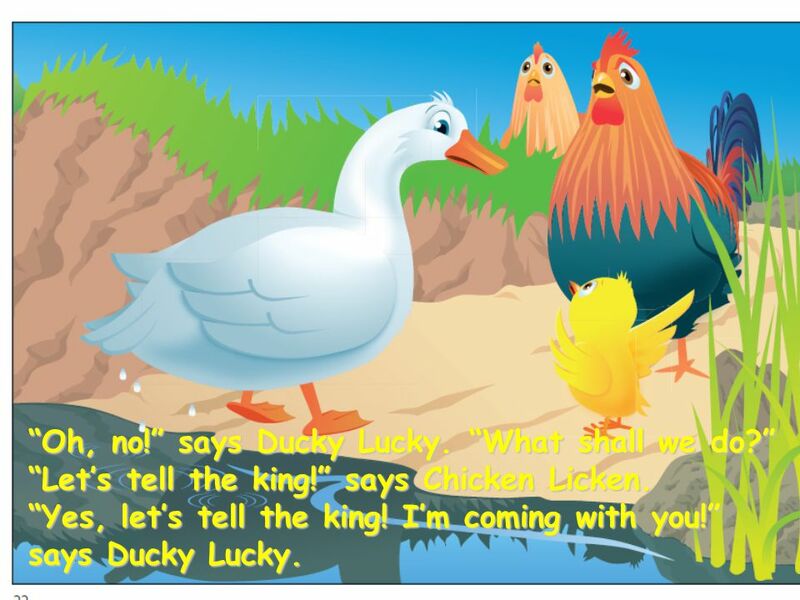 “What shall we do?” “Let’s tell the king!” says Chicken Licken. “Yes, let’s tell the king! I’m coming with you!” says Ducky Lucky. 23 The sky is falling! We are going to tell the king! 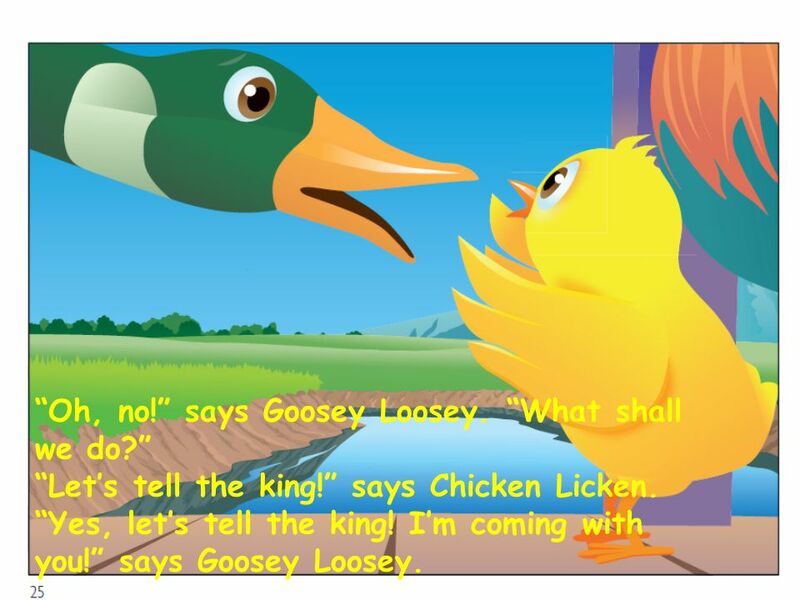 25 “Oh, no!” says Goosey Loosey. 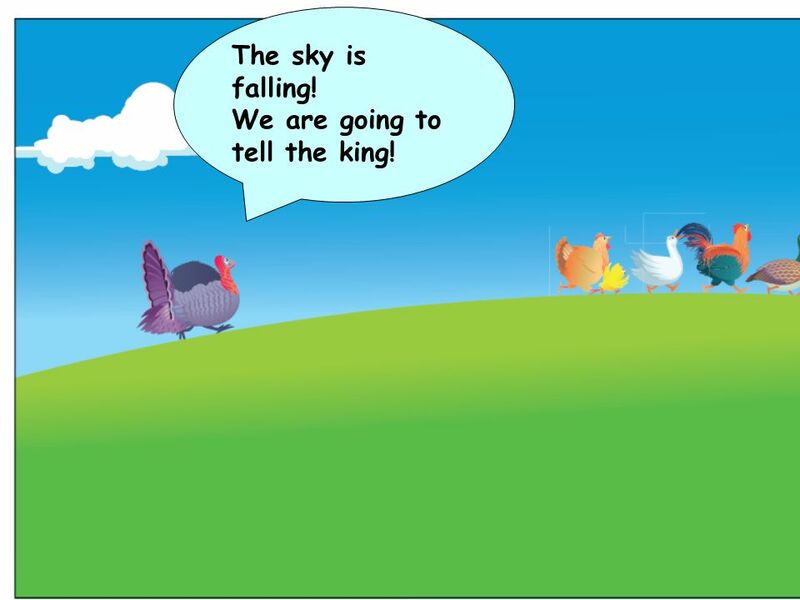 “What shall we do?” “Let’s tell the king!” says Chicken Licken. “Yes, let’s tell the king! I’m coming with you!” says Goosey Loosey. 26 The sky is falling! We are going to tell the king! 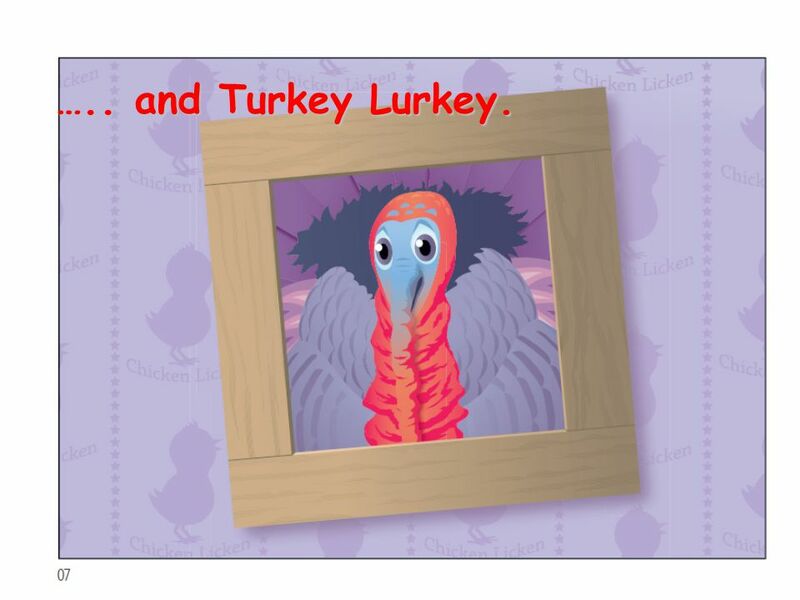 28 “Oh, no!” says Turkey Lurkey. 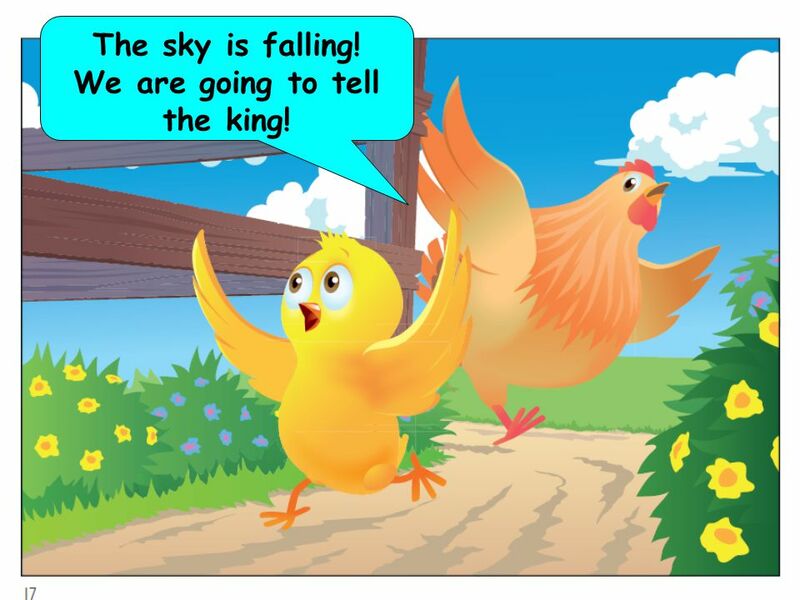 “What shall we do?” “Let’s tell the king!” says Chicken Licken. “Yes, let’s tell the king! I’m coming with you!” says Turkey Lurkey. 29 The sky is falling! We are going to tell the king! 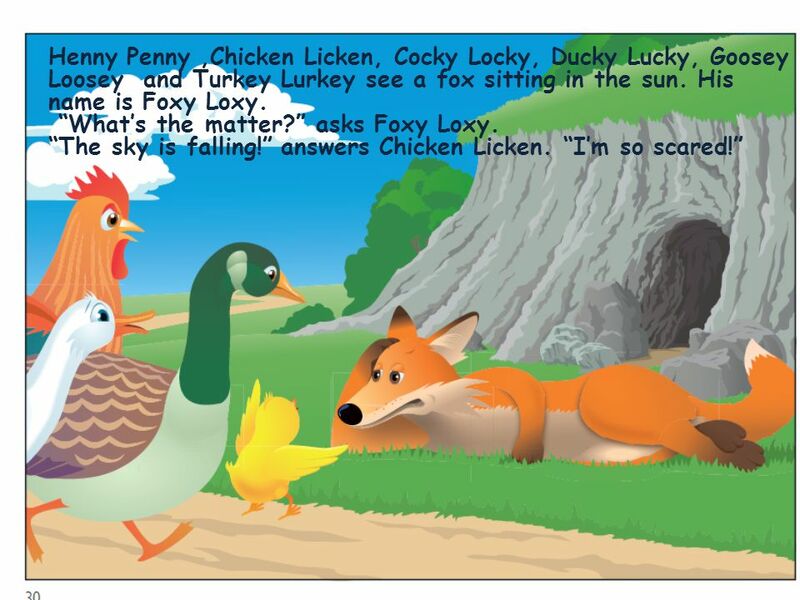 31 “Oh, no!” says Foxy Loxy. 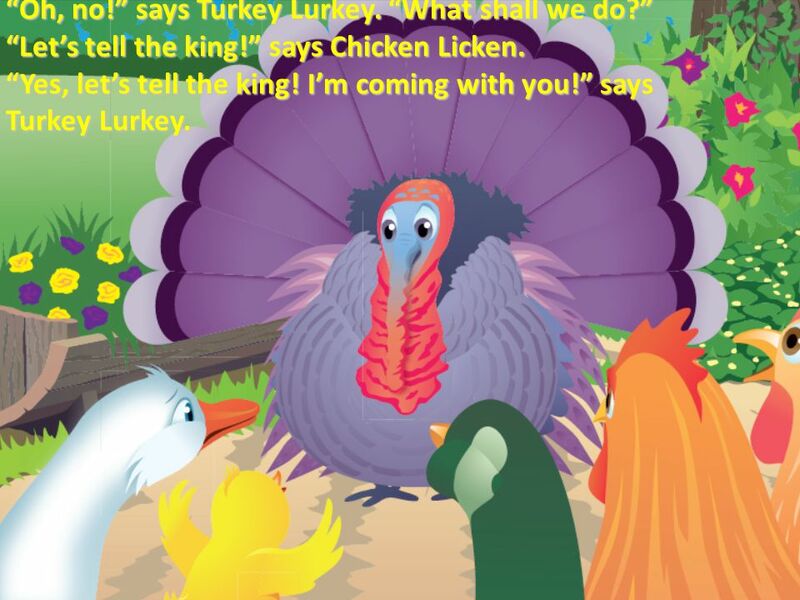 “What shall we do?” “Let’s tell the king!” says Chicken Licken. “Yes, let’s tell the king! Come with me” says Foxy Loxy. 32 They all walk into a cave. 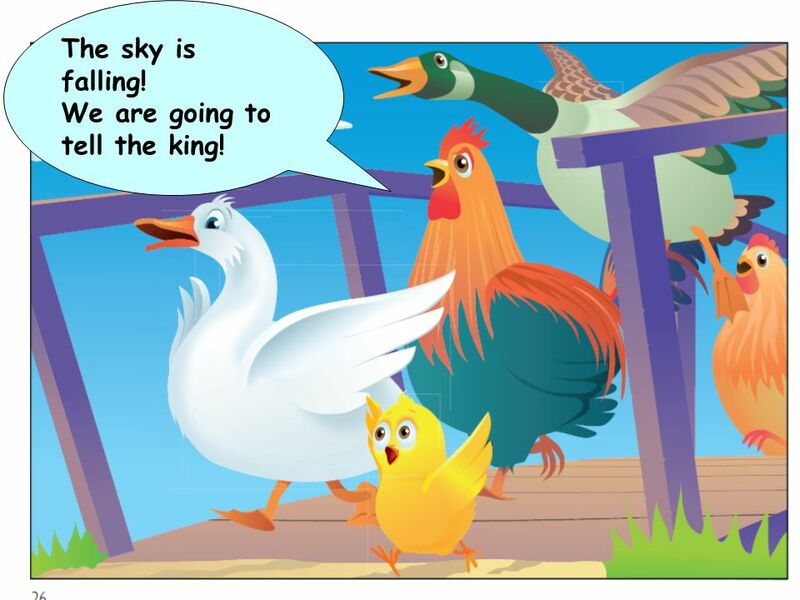 “Is the King here?” asks Chicken Licken. “No!” says Foxy Loxy. 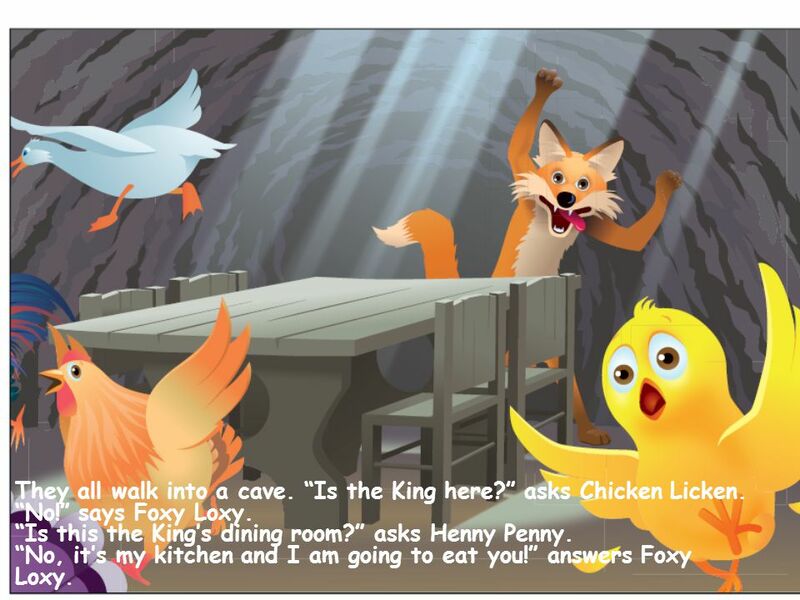 “Is this the King’s dining room?” asks Henny Penny. “No, it’s my kitchen and I am going to eat you!” answers Foxy Loxy. 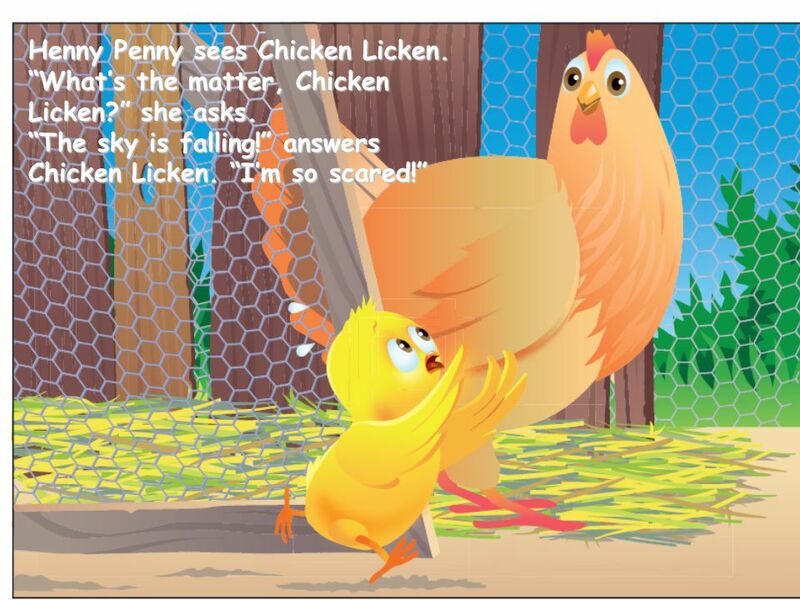 Download ppt "This is a story about Chicken Licken. 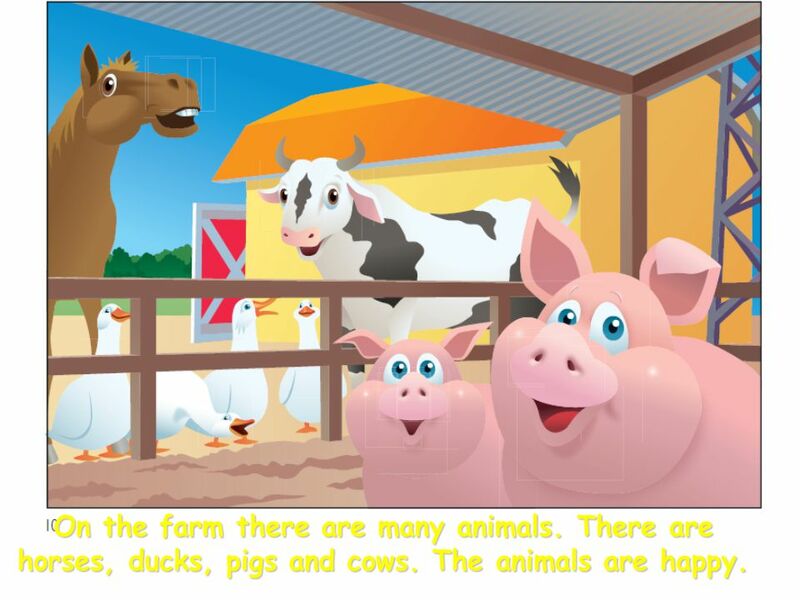 … and Henny Penny." Snow White Do you know these stories? Ugly duck Sleeping beauty. Nanas Net Friend Have you ever had a net friend? 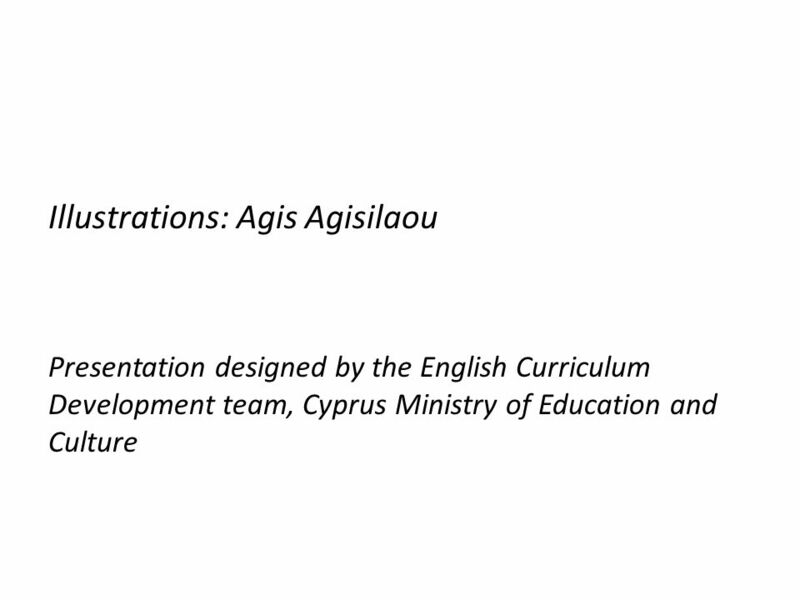 Have you ever met him or her in person? Nana has a net friend, and lets talk about her story! UNIT 19 Lesson 1 - evaluation. Where are they? They are at a restaurant. They are eating.